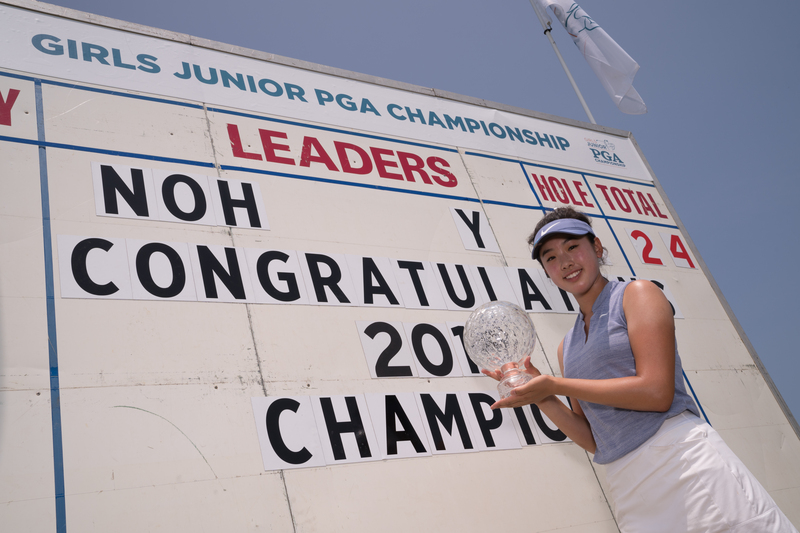 LEXINGTON, Ky. (July 12, 2018) – Yealimi Noh gained control of the 43rd Girls Junior PGA Championship during the second round and never looked back. The 16-year-old from Concord, California, showcased a dominating performance at Kearney Hill Golf Links in Lexington, Kentucky, en route to a convincing four-stroke victory. After rounds of 66-65-64, Noh finished with a final-round 3-under 69 to close at 24-under 264 for the Championship, setting the record for the Championship’s lowest 72-hole tally. All this comes just one year after finishing runner-up in the 2017 Championship. Last year’s winner Rose Zhang finished with a solo second place at 20-under 268 (68-67-67-66), matching her total from 2017. Noh collected 25 birdies this week and posted just one bogey, which transpired on her 66th hole of the Championship – Kearney Hill’s par-3 12th. After improving by one stroke each round, Noh may not have played her best on Thursday. Yet, she still broke 70 with four birdies and bumped her total birdie count on par 5s to 13 for the week (out of 16). With the victory, Noh earned a berth onto the 2018 U.S. Junior Ryder Cup Team, which will be staged on September 24-25 at Disneyland Paris. In addition, provided she maintains amateur status, Noh also qualified for the inaugural Augusta National Women’s Amateur Championship held next April. Zhang carded her best round of the 2018 Championship on Thursday with a 6-under 66, finishing with a consecutive 20-under-par score at the Girls Junior PGA Championship. Grouped with Noh on Thursday, Zhang acknowledged the magnitude of her friend and playing partner’s performance. A birdie on the 18th hole secured the Irvine, Calif., resident a spot on the 2018 U.S. Junior Ryder Cup Team as well, edging out third-place finisher, Alexa Melton of Covina, Calif., by one stroke. Melton, who posted the Championship’s lowest-ever 18-hole score on Monday with a 63, finished in style with eagles on the par-5 14th and 18th, as well as birdies on 16 and 17. A 19-under 269 secured a solo third place. Thirteen-year-old Alexa Pano (70-64-70-67-271) from Lake Worth, Florida, and Greenwood, Indiana’s Erica Shepherd (65-67-72-69-273) rounded out the top five.